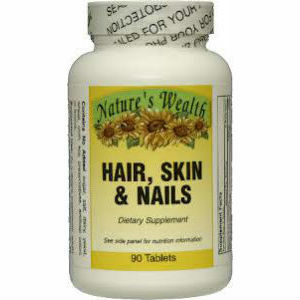 This is a review of Nature’s Wealth Hair, Skin & Nails Formula Vitamin Supplement. The manufacturer of the product claims that it is a comprehensive formula designed to maintain healthy skin and promote the growth of nail and hair. Read on, to learn more about its ingredients and our opinion of whether it is the right product to take for the health of your hair, nails and skin. Other ingredients include Dicalcium Phosphate, Silica, Magnesium Stearate, Vegetable Stearin, Cellulose, Modified Cellulose and Modified Cellulose Gum. It is recommended that as a dietary supplement, adults take three tablets of this product daily at mealtime or as directed by their health care professional. This product is considered safe for long term use. However, if you are pregnant, nursing, taking any other medications or have any medical condition, you should consult your doctor before using it. In case of an allergic reaction to any of the ingredient of the product you need to discontinue use and get immediate medical attention. The price of one bottle of this product containing 90 tablets is listed as $14.75 on the website of the company. The manufacturer doesn’t offer any kind of discount on bulk purchase of this product. The manufacturer of this product has not offered any kind of return, exchange or money back guarantee. This is really concerning because if you are not satisfied with the product and if you feel that it is not showing the desired results then you have no way of returning it or getting your money back. There are also no reviews of this product on the website of the company which makes it a questionable purchase. Nature’s Wealth Hair, Skin & Nails is a comprehensive formula containing nutritional supplements, vitamins, minerals and herbal extracts. The manufacturer of this product claims that it can promote healthy skin, nails and hair as it is made up of high-quality natural ingredients without any added sugar, dairy, yeast, salt, gluten, corn, artificial color, flavors, sweeteners or preservatives. However, the manufacturer of the product has not offered any kind of return, exchange or money back guarantee. In addition to this, there are also no reviews of this product on the website of the company. So, the bottom line is that this may not be the best nutritional supplement for you. John Brownstone	reviewed Nature’s Wealth Hair, Skin & Nails	on November 20th	 and gave it a rating of 2.5.